There's no denying the quality of design and artistry shown in something made by hand. 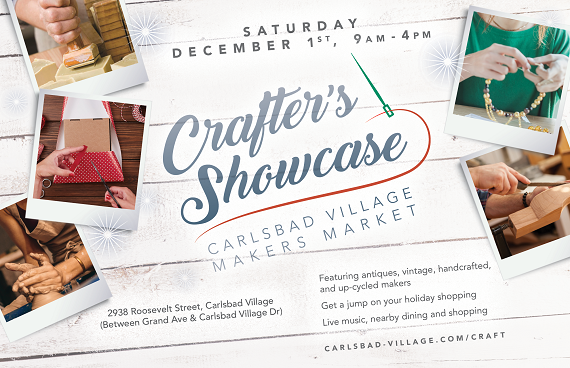 On Saturday, December 1st, in downtown Carlsbad Village, come celebrate 50 local and regional artisans and their skill in a particular craft. Find handmade, vintage, upcycled, and unique goods at the Crafter's Showcase that will highlight the crafter's creativity in the areas of woodworking, leatherwork, 3D functional art, natural jewelry, beading, fabric creations, linen restoration, re-purposed materials, artisan foods, and much more. From 9 am to 4 pm, in the north lot on Roosevelt Street (between Carlsbad Village Drive and Grand Avenue) the downtown Village will turn into an open-air makers market. All applicants are juried and only self-designed and handcrafted items will exhibit in this venue. Come listen to live music, stroll through the booths, enjoy food discounts at nearby dining, and experience the Village. The Crafter's Showcase is a free community event. Get a jump on your holiday shopping at this unique and fun Makers Market in the heart of downtown Carlsbad Village. Interested Crafters can apply online at http://www.kennedyfaires.com/carlsbad/crafters-showcase. For more information, please email chris@carlsbad-village.com or call 760-644-2121.